EXTREMELY VERSATILE TARP: Set up a weatherproof shelter for your hammock, tent, or campsite. Protect your equipment and camp kitchen during a storm. Erect with tarp poles on the beach or in a park to provide a shade haven. When the weather gets GNARLY, depend on GNARWHAL GEAR. FITS YOUR CAMP: 12 x 9 foot hexagon shape provides a HUGE rain-proof footprint for up to a 12ft hammock. Fits the ENO Doublenest PERFECTLY! 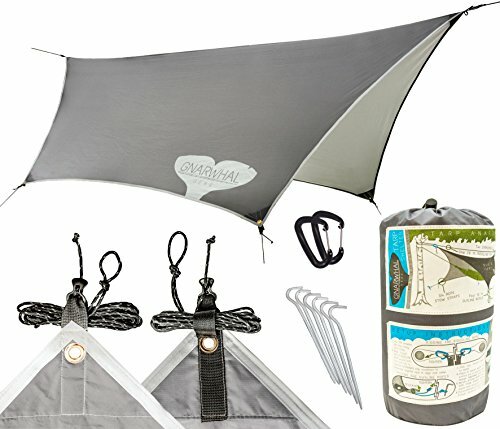 Room for 4 people as an ultralight tarp tent! 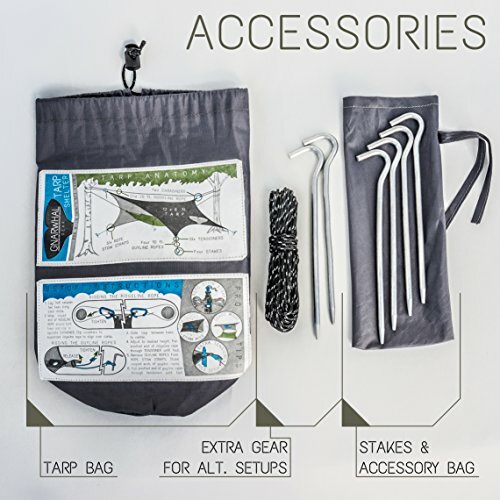 ALL-INCLUSIVE DESIGN: Rainfly accessories include 6 aluminum stakes, tarp bag, stake bag, 2 Aluminum carabiners, and over 90 feet of durable reflective guylines (2×29.5 ft ridgelines, 4×10 ft guylines). 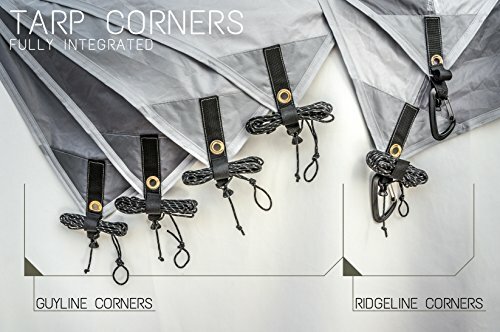 Heavy-duty, reinforced tarp corners include corrosion resistant grommets, nylon loops, velcro line stow-straps, and integrated Lineloc tensioners. Engineered for quick set-up on the fly! A distinctive member of the Narwhal family of unicorn-horned arctic whales, one who has gone beyond radical, beyond extreme. A gnarwhal tends to experience a life high on the scale of dangerousness and coolness, often approaching mythical proportions. The Gnarwhal Gear Tarp Shelter is designed around providing the optimal camping experience. At 12x9ft, this tarp is larger than most anything else out there and is packed with high-end design features. Whether you’re a casual hammocker or a minimalist backpacker, this is the rainfly for every adventure. These pieces are used to set up your Tarp Shelter with tarp poles in freestanding mode. Here at Gnarwhal Gear, we engineer high quality outdoor products packed with seriously useful design features. Check out Gnarwhal Gear’s website, Instagram & Facebook for sweet pics and videos of fresh ways to set up your Tarp Shelter! You can submit photos of your gnarliest camp setups, share ideas, and connect with the designers! We proudly stand behind our products, which is why we offer a lifetime warranty to the original owner against material and workmanship defects. PRO ALL-WEATHER PROTECTION: 100% waterproof 210T Polyester Rip-stop material will keep you totally dry and won’t stretch when wet. Polyurethane (PU) coated and UV protective fabric. SETUP MADE EASY: Illustrated instructions are printed right on the bag! Extremely user friendly cord tensioners are attached on every corner! Ridge-line and guy-lines come pre-installed in the tensioners! Catenary-cut edges make it simple to set up your rainfly taut and keep the sides from flapping in the wind. The bi-colored tarp makes identifying the ridge-line a cinch!